Radiation from sources in our galaxy could have had a profound effect on mutation rates throughout the history of life on Earth. Studying ancient life on Earth is important for astrobiologists who are interested in how speciation and radiation occurred throughout the history of our planet. However, it’s not always easy to pinpoint these events in time. For instance, when looking back at the history of life, there is a disparity between fossil ages and molecular divergence dates for some groups of organisms. Molecular ages for the origin of species are usually higher than fossil ages, and the disparity between fossil and molecular ages has often been attributed to the fact that fossils only provide a lower boundary for ages. Gaps in the fossil record always make it tricky to determine when exactly speciation occurred. A new study looks at the problem from the perspective of physics, examining a potential bias in molecular ages tied to the fact molecules do not always change over time at a constant rate. The rate of evolution can be affected by many things, such as selection pressures or communities that become isolated from the rest of the population. The history of Earth is also full of large-scale events that could cause dramatic increases in mutation, such as exposure to radiation events from nearby supernovae or other sources like gamma ray bursts. The study, “A possible role for stochastic radiation events in the systematic disparity between molecular and fossil dates,” will be published in the upcoming book Earth and Life II. The work was supported by the Exobiology & Evolutionary Biology element of the NASA Astrobiology Program. 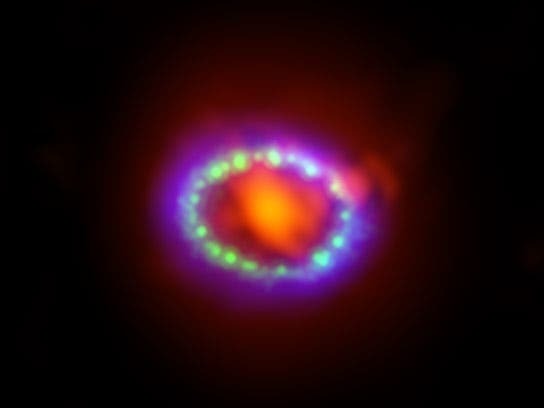 The image at the top of the page shows the remnant of Supernova 1987A seen in light of very different wavelengths. ALMA Observatory data (in red) shows newly formed dust in the center of the remnant. Hubble (in green) and Chandra (in blue) data show the expanding shock wave.